Barcelona somehow managed to leave the Sanchez Pizjuan on Saturday with their 100% record still intact. Two late goals secured the three points in a thrilling 3-2 win that left hosts Sevilla empty handed and removed their unbeaten record in the league this season. Setting the result aside, there were positives and negatives for both managers to ponder as the season progresses. Michel kept faith with the same starting eleven that had defeated Real Madrid and then Deportivo La Coruna in the previous two league games. Tito Vilanova made three changes to the side that defeated Granada reinstating Xavi to the starting line up in place of Thiago. At left back, Jordi Alba replaced the injured Adriano whilst Pedro started in place of Villa on the left wing. There have been a number of subtle changes to the manner in which Barcelona are playing this season under Vilanova and these are discussed below. Michel adopted broadly the same shape that had proven successful against Real Madrid. Navas offered width and pace on the right whilst Trochowski tucked in on the left providing support to the midfield centrally. The diagonal pass to Navas was a feature of Sevilla’s play for the entire game and it helped curb Alba’s attacking enthusiasm. Was Pedro stationed on the left wing in the first half to provide additional defensive cover to Alba against the pairing of Navas and Cicinho? Trochowski’s positioning offered Alves the ability to push on during transitions with Trochowski caught infield but this seldom occurred. 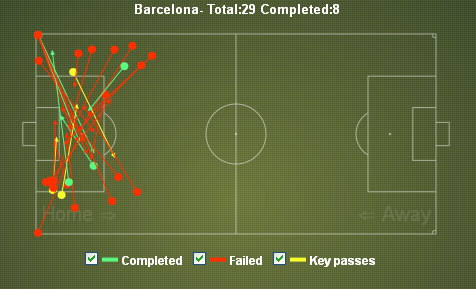 Barcelona were slow in possession, often choosing the correct passing option but making the decision to slowly. Consequently, Sevilla were normally able to regain shape and structure with Medel and Maduro congesting the centre of the pitch directly in front of the centre back pairing. As they did so successfully against Real Madrid, Sevilla sought to hold a high line, aiding the congestion in the middle of the pitch. When Barcelona were able to increase the tempo of the game, their combination play presented problems for the hosts and a number of half chances were created, typically through the trio of Xavi, Messi and Cesc. The first noticeable difference for Barcelona this season is the shape of the side. Whilst the various TV and media sources still use graphics displaying Barcelona as lining up in their usual 4-3-3, on the pitch it’s somewhat different. Messi moves deeper now into a classic No10 position on the pitch and is more or less laterally aligned with the most advanced of Barcelona’s midfielders. Last night this was Cesc. With Xavi operating slightly deeper alongside Busquets, it’s not unusual to see the two wide players being positioned furthest forward. In this respect, Barcelona often now resemble a loose 4-2-2-2. The essential aspects of the system, as adopted by Barcelona, are that the wide players must drive in diagonally when required to provide the central focal point of the attack. When Messi moves very deep, there is an onus on Xavi to drive forward into space. Whether Xavi can sustain such a role over a long season remains to be seen. Also worth consideration is Busquets now moves slightly further forward in games, offering less potential cover to the defence. Sevilla’ opening goal arose when Song needlessly challenge Negredo for a ball in the Sevilla half. Rakitic collected the loose ball and was already ahead of Busquets eliminating him from this phase of play. Medel received a pass in the right hand channel and was allowed to shoot without being pressed, his deflected shot collected by Trochowski who fired home despite Dani Alves being in close proximity. Alves, lazily, made no attempt to close him down, almost inviting the shot. Song, meanwhile, was unable to recover his position in this moment. There were further episodes of Barcelona being disorgansied and not communicating properly in defence. A few moments later, Song and Busquets almost collided when they contested the same aerial ball despite no Sevilla player being close by. The defensive confusion reached a peak in the 36th minute when four defenders pursued Navas as he ran diagonally from right to left. Nobody tracked Negredo as he made the opposite run from left to right. When Rakitic released him, Negredo’s shot from the edge of the penalty area went just wide. The decision not to purchase another centre back in the summer has been highlighted by injuries to Pique and Puyol simultaneously. Individually Busquets, Mascherano and Song are all options for centre back alongside an established central defender. With any two used in a pairing however, there is a lack of awareness and communication. The development of Messi has seen him move from a right winger to a central striker to his current deployment in the false 9 role but increasingly Messi starts in a deep position and advances rather than starting in an advanced position and dropping deep. Messi is now functioning more like a classic No10. 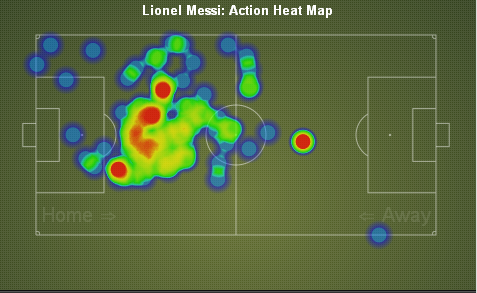 The heat map below shows Messi’s positioning against Sevilla. Messi is now starting deep and advancing but opponents have realised this and with no central striker for Barcelona, defences can push high, congest the central area and squeeze the space between defence and midfield. How do Barcelona counter this? Barcelona need a reference point in attack. This does not necessarily mean a traditional No9 but they need someone in that role to occupy the opponent’s central defenders. This role is no longer performed by Messi. Last night, this meant it was Cesc who moved forward into the No9 role but there were also times when Xavi, Pedro and Sanchez all broke into central positions to perform that duty. Both goals from Cesc were examples of this. In each case he was already ahead of Messi when either moving onto or receiving the ball. Have Barcelona become a little more direct this season under Vilanova? Last season Barcelona averaged 17 crosses per game. With six games played so far, they are averaging 19 crosses per game. Last night this figure increased substantially as they attempted 29 crosses into the Sevilla box. Only 8 were successful. With such a small team physically, unless the cross is exceptionally accurate or the penalty area is sparsely populated, Barcelona are going to win few aerial duels in their opponents penalty area. Furthermore, a notable recent development has been the gradual increase in the number of long kicks / passes by Valdes in goal. 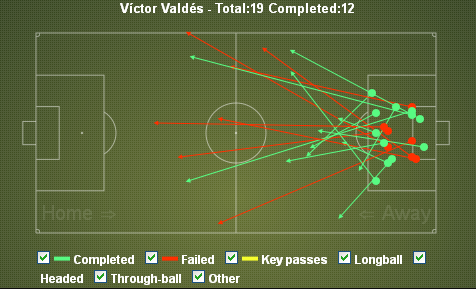 The table below shows Valdes distributing the ball on 19 occasions, only 12 of which were successful. By kicking longer, more often, Valdes reduces the risk of a misplaced pass to a team mate in a dangerous area of the pitch. The exact type of pass which led to goals against Real Madrid over the past two seasons. The converse of this is that it enables opponents to regain possession more frequently thus increasing the pressure on Barcelona’s somewhat fragile defence. Barcelona struggled at times during the first half due to Sevilla’s set up and also because they lacked intensity in their own play. Too often the ball was passed correctly but too slowly allowing Sevilla to regroup. This altered in the second half as they began to play at a higher tempo and with greater width, both full backs now moving forward particularly Alba on the left. With Sevilla tiring, Xavi began to receive more space to pass and dictate the tempo. The most significant development in the second half however was not a tactical move by either side. It was arguably the sending off of Gary Medel. It’s difficult to see how Sevilla would have lost the game had Medel remained on the pitch. Both of Barcelona’s late goals emerged in the central area which had been protected partly by Medel. On both occasions, Messi had time to lay off a pass to a team mate. With only 10 men, Sevilla inevitably fell deeper and had less of an opportunity to break with nobody remaining high up the pitch. Michel made three substitutions against Barcelona. Rakitic, Trochowski and Negredo were all replaced with the introduction of Kondogbia, Manu and Luna. The same three players were withdrawn against Real Madrid and the same three players were introduced. Whilst Manu was introduced due to injury to Trochowski midway through the first half, the other substitutions were reactive as Michel sought to hold on for victory. Following the dismissal of Medel, the tiring and more attack minded Rakitic was replaced by Kondogbia to provide greater defensive stability and energy in the centre of the pitch. In the 80th minute Negredo was replaced by the defensive Luna in response to Vilanova’s attacking gamble to remove Alves for Villa. Luna moved to the left side of midfield and Manu moved, notionally, to the central striking position as Sevilla were now operating along the lines of a 4-4-1. In both games against Madrid and Barcelona, Sevilla have been tactically sound with Michel reacting to developments on the sidelines astutely. Sevilla look different this season. With stories emerging of Michel having a more harmonious dressing room, the results can be seen on the pitch. The team have creativity and flair but are prepared to work extremely hard too, particularly the attacking players in the team. In two key games, Rakitic has been asked to close down the opposition’s main midfield playmaker, Alonso for Madrid and Xavi for Barcelona whilst simultaneously being the most advanced midfield player for his own side. The Croatian has managed to perform both tasks but understandably tired in both games and was substituted. There have been similar performances too from Trochowski, Negredo and Navas especially. Each player performing their defensive duties with a tremendous worth ethic earning the right to then launch attacking moves. Barcelona, as is normal, dominated possession. With 624 successful passes form 731 attempted compared against Sevilla’s 212 successful passes form 297 attempted. The ability to convert that possession into goals however proved a touch more difficult as a highly organised Sevilla side came very close to successive home victories over the big two. Amongst the host of positive points arising from the game from a Sevilla perspective, two issues will leave Michel disappointed. The loss of two late goals and the dismissal of Gary Medel. Irrespective of whether the red card was correct or not, the Chilean should know better than to confront an opponent in such an aggressive fashion forcing the referee to make a decision. If this performance level can be maintained, Sevilla will surely be contesting the Champions League positions at the end of the season as once again the Ramon Sanchez Pizjuan becomes an inhospitable venue for opponents. Barcelona have now won their opening six league games of the season. Only on one occasion have they won the first six league games and not secured the league title. Yet defensive frailties persist and there is the feeling that the team are not yet operating at maximum. With Benfica and Real Madrid coming up in the next seven days, the reports of Puyol traveling with the squad to Lisbon will raise hopes. For despite the six wins, there is still much for Vilanova to ponder.